Thunderstorms produce a number of adverse weather conditions caused by climate change in your region. One devastating bi-product of a thunderstorm is lightning strikes. Typically a strike is an electrical discharge- a conductive arc-between the negatively charged atmosphere and the positively charged Earth. Strikes can also be within or between clouds, known as intra/inter–cloud flashes respectively. A lightning strike happens through a series of events in a cloud creating strong electric fields acting on the Earth’s surface. These discharges have the strength of inflicting catastrophic damage on facilities and its sensitive electronic equipment. 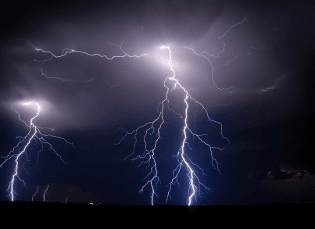 According to experts there are two accepted mechanisms for lightning propagation, indirect and direct. Direct lightning finds the least path of resistance by propagating through steel structures, using them as a conductive path to earth. The destructive power of strikes on facility structures and external/internal equipment can be devastating. Exposed conductive structures need lightning protection such as conveyors, refinery structures, hoppers, scaffolding and girders. 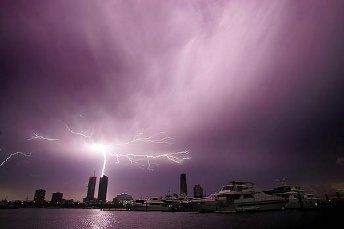 At LDU we can find the best lightning protection solution for your industry. We have a range of lightning protectors, uninterrupted power supply equipment and power surge protectors for every industry application. Lightning enters the ground, continuing through the earth in a radial pattern. The depth of penetration is proportionally relative to the impedance of the soil. This can cause catastrophic incidents in underground mines, installations, pipes, telecoms and data connections. LDU can provide a full risk assessment of facility’s vulnerability against indirect strikes. Contact our LDU expert team on how we can efficiently test your site. Thunder is an acoustic shockwave formed shortly after a strike. Thunder is the result of the heat dissipation along the lightning’s conductive channel. The air surrounding the channel quickly heats, expands and explodes faster than the speed of sound. The sound has various inaudible and audible frequencies. At distance thunder is relatively harmless. However within close proximity with strikes, a thunder shockwave can release 10 atmospheres of pressure causing personal injury or damage to facility structures. By using LDU as your preferred installer and supplier you are investing in the future stability of your facility’s production efficiency. We can supply you with the best uninterrupted power supply equipment and power conditioners at the most competitive prices. At LDU we can survey your site and produce a risk assessment of your facility from direct and indirect. We have the best equipment for power protection using quality UPS systems and other surge protection equipment.